When a medical coder enters the codes from a patient visit, he or she must always be aware of how all the codes fit together. Codes are the translated version of office or inpatient visits performed on a patient. When they are put together, they have to make sense. CPT, HCPCS, and ICD-9 codes tell the story of what happened at the doctor's visit. If the codes don't combine in the right ways to make sense, the patient's insurance company may deny some or all of the codes on a claim. Sometimes, for the codes to make sense together, the medical coders have to put in additional modifiers to certain codes. Modifiers add information about the office visit and the procedures that were performed. They're sometimes necessary in order to make sure all codes are paid correctly, and for the insurance company to receive a full account of what happened at the visit. There are dozens of different modifiers that can be added to a claim. 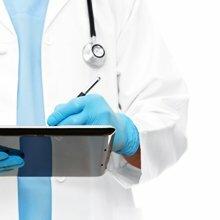 They range from differentiating between office and laboratory procedures, indicating additional services, and the extent of the patient's treatment. In primary care, perhaps the most commonly used modifier is 25. Modifier 25's description is "Significant, Separately Identifiable Evaluation and Management Service by the Same Physician on the Same Day of the Procedure or Other Service." In other words: the patient came in for a routine exam, but it was found that they also had a severe ear infection. This isn't a typical component of a routine physical exam. So the physical examination (evaluation and management) code would be appended with the modifier 25, to indicate that it was separate from the examination of the patient for the ear infection (separately identifiable evaluation and management service). This modifier is used because the services, although performed on the same day, are not typically related to each other or performed on the same date of service. Another modifier is modifier 91. The description of 91 is Repeat Clinical Diagnostic Laboratory Test. You might use modifier 91 in a clinical setting, in which a patient comes to the office with a severe ear infection. The doctor decides to perform a Complete Blood Count (CBC) to check the patient's white blood cell count. The physician then decides that the patient needs an injectable medication as treatment for the ear infection, which is administered at the office visit. The doctor asks the patient to return within the next two hours, after the medication has started working. When the patient comes back, the doctor orders a new CBC, to see if the white blood cell count has improved. This second CBC code would be appended with modifier 91. There are many more medical coding modifiers. As you can see from the above examples, each one has very specific instances in which they would be used,. The modifiers you'll use on a daily basis depend on your provider's specialty as well as the patients that come into the office. For more information, as well as a complete list of modifiers, see the current year version of the CPT code book (medical coding publications). How do you code a modifier? Adding a modifier to a code is very simple. Because they're so common, medical billing and coding software systems usually include an open modifier field right next to the procedure code field. If you determine that a modifier is needed, all you have to do is add it next to the specific procedure code. The most important thing to remember, however, is that they are procedure modifiers, not diagnosis modifiers. Modifiers can only be added to procedure codes - you can't modify the description of a diagnosis. How do modifiers affect claims processing? Knowing when and when not to add a modifier, as well as which one to use, is a very important part of being a good medical coder. The wrong modifiers can severely affect claims processing and payments. To see how medical coding modifiers affect payment, let's return to the same example we used earlier, about the physical exam and the ear infection patient. Both of the procedure codes used to report the two services are E&M (Evaluation and Management) codes. Many insurance companies won't pay for two E&M services at the same office visit, unless one of them is appended with modifier-25. In this case, if you failed to add modifier-25, the claim would not be paid in full. You'd have to correct the claim by adding the modifier and refiling it to the insurance company. Correcting and refiling a claim can extend the claims payment and finalization process into months and months, rather than the typical three weeks. Some insurance companies (like Medicaid) sometimes require medical coding modifiers which indicate what type of provider saw the patient. For example, was the patient seen by the physician or nurse practitioner? On the other hand, other insurance companies may deny claims with these modifiers. A final piece of advice: make sure your claims are coded correctly before you send them. It's easier and faster to hold a claim for a day or two, waiting on more information, than it is to spend months waiting on a corrected claim to be paid.